Why Watch it Today? : Today is National Puppetry Day. 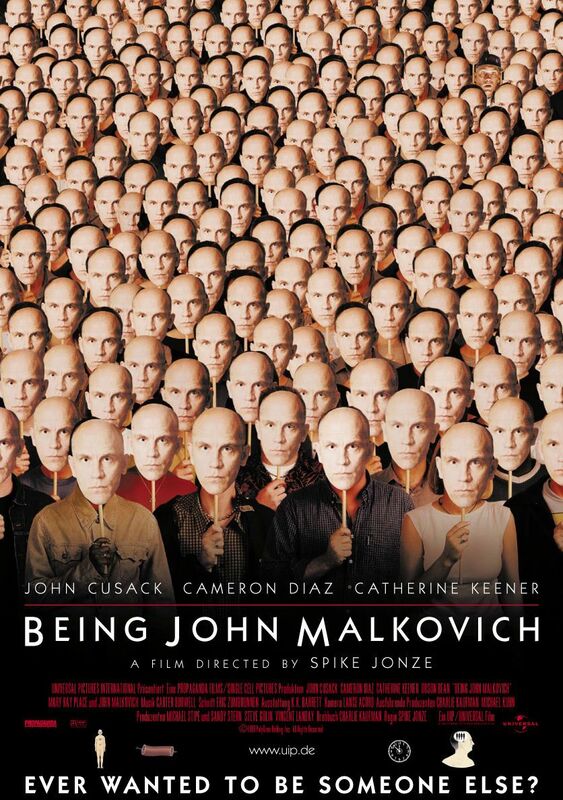 Being John Malkovich is the debut feature film from director Spike Jonze and writer Charlie Kaufman, each of whom have gone own to careers of great acclaim that continue to grapple with many of the themes evident here. This entry was posted in Arthouse, Black Comedy, Comedy, Drama, Fantasy, Independent, Indy, Movie of the Day, Satire and tagged Best Director Nominee, Best Original Screenplay Nominee, Best Supporting Actress Nominee, Brad Pitt, Cameron Diaz, Catherine Keener, Charlie Kaufman, Charlie Sheen, David Fincher, head film, John Cusack, John Malkovich, mind transferrence, New York City, Octavia Spencer, office building, Orson Bean, puppeteer, Spike Jonze. In our first year, I think, I did Empire of the Ants for Carpenter Ant Day….there really is a day for everything my friend! Re: Thunderbirds are Go!, would you believe I’ve never seen it? I saw some of the “Supermation” shows back when I was a kid, but I’m never quite sure which ones they were.